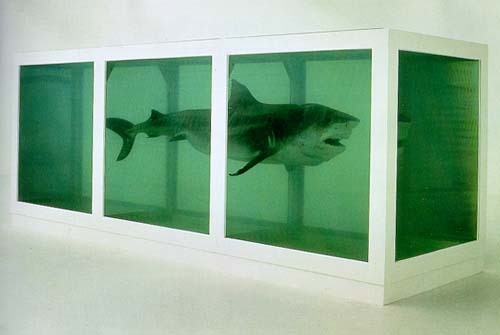 Anyhow, I think that listening to these stories piqued my interest in the art market, which is why I wanted to read Don Thompson's book, The $12 Million Stuffed Shark: The Curious Economics of Contemporary Art. The book discusses the everything you wanted to know about the art market: auction houses, prices for art, art as an investment, galleries and dealers, etc. I have to admit, though, the middle of the book was rather uninteresting. Thompson focused a lot of auction prices and technicalities. I think this information would be very useful to anyone who is interested in buying or selling art, but it wasn't very compelling from a historical standpoint. Perhaps I shouldn't have set my expectations too high - I knew that Thompson was an economist (and not an art historian) when I started to read the book. The ending of the book completely redeemed itself, though. Thompson devoted a whole chapter to how art crime (especially forgeries) affect the art market. One interesting story was from May 2000, when Christie's and Sotheby's realized that their most recent auction catalogs were offering the exact same painting for sale, Gauguin's Vase de Fleurs (Lilas), 1885. Obviously, one of the paintings had to be a fake. The auction houses showed the works to a specialist, and it was later determined that Christie's was selling the copy. The FBI ended up getting involved and a complex art scandal was unearthed that involved Ely Sakhai, the owner of the original Gauguin painting. Anyhow, I don't know if I'll read this book again, but I think it is a good resource for the art world. I'd recommend this book to anyone who is seriously interested in buying or selling contemporary art. This is my last book for heidenkind's Art History Challenge.